Let’s talk about men and women. Let’s strip down the anatomy with all the extra body parts and differences in skin texture and hair, and look at our very core. At our very spirits we are different. A woman is nurturing, and finds it easy to give love. A man is also nurturing, but less so, and more of a provider and protector. It’s how we were designed, and there is nothing wrong with God’s perfect design. But where it becomes a problem is when you take the two unique sides, and they become one in marriage. If they do not understand what each other needs the relationship is going to be about as comfortable as fingernails down a chalk board. In Ephesians 5:28-30 Paul addresses the husband. He says “husbands ought to love their wives as their own bodies. He who loves his wife loves himself. After all, no one ever hated their own body, but they feed and care for their body, just as Christ does the church— for we are members of his body.” Again, marriage is to be like Christ and the Church. Christ died not simply to protect us but because he loved us with agape love, a love that was unconditional and not based on our actions. Men, your love has to be unconditional and not based on how your wife is acting at the time. This is true love, and a love worthy of marriage. It bears to mention that Paul’s God-inspired words did not address the wife to love her husband. A woman loves naturally, albeit at different levels. It’s in our nurturing spirit to love those around us. This is part of the unique creation of woman. God designed us to be mothers, caretakers of our children. Had we not had a strong desire to love and be loved built within our spirits, I dare say on trying days we might just walk away from our own offspring! Paul goes on in verses 31-33 saying, “For this reason a man will leave his father and mother and be united to his wife, and the two will become one flesh.” This is a profound mystery—but I am talking about Christ and the church. However, each one of you also must love his wife as he loves himself, and the wife must respect her husband.” Two become one – just as we are in Christ and become part of His body. Consider how it feels to be part of the Body of Christ. Do we ever question His love? Of course not! His actions spoke quite clearly of His infinite love for us. Husbands, your love has to be as apparent as Christ’s love. Saying “I love you” on the wedding day is not enough to get your wife through the years of being bonded to you. We thirst for love, and we grow closer to you through love. Men, love can be shown in different ways, and your wife has her favorite ways to accept your love. In the book by Gary Chapman “Five Love Languages” he lists five ways we all speak love. Your wife may not see love as strongly in some of the five as in others. The five ways are: Words of Affirmation (telling her vocally you love her), Quality Time (spending time with her), Receiving Gifts (buying her things), Acts of Service (doing things for her), Physical Touch (hugs, pats on the back, and the bedroom). Your way of speaking love may be different from hers, and it’s worth a conversation to see how she prefers to receive love. You could be trying your hardest to show her love, and she may not be getting it. Maybe the acts of service you are doing are resonating with her as you being too busy to spend time with her. Maybe your physical touch is speaking to her that you lust for her rather than love her. Have the conversation, and stop wasting your time trying to be loving in the wrong ways. Ladies, your husband needs your love to be apparent too, but he also needs something extra. He needs to feel respected. This comes from the chain of command that we talked about yesterday. Just as God needs our honor, your husband needs to feel honored by you as well. Respect can be shown in as many ways as love. It’s in saying “I’m so proud of you” or “I trust you”. It’s in celebrating his achievements, and following his direction without complaining. In the same way we thirst for love, your husband thirsts for respect. Perhaps the best way to describe respect is to tell you what it isn’t. It isn’t going behind your husband’s back and speaking negative of him to your friends, and, God forbid, your children. It isn’t bringing up his staining his reputation by publicly telling things that are within the confidence of marriage. It isn’t in calling him dummy, fool, or stupid, or making him feel that he is. It isn’t turning your back on him when he has been disrespected by others. It isn’t telling your children to do something opposite of what he said. It isn’t in you breaking the chain of command and doing something that you know he doesn’t want you to do. To your husband, the pain he feels in being disrespected by you is the same you feel should he say to you “I don’t love you”. So what happens when the husband feels disrespected? He stops showing love. When he stops showing love, the wife stops feeling loved. The wife then shows more disrespect because she’s not having her need satisfied, and the husband is not filling his role. Then she shows even less respect. It’s a vicious cycle that ends in nothing less than divorce. Emerson and Sarah Eggerich wrote a book called “Love and Respect” on this very subject. In it they give an astounding statistic. Of 7,000 husbands and wives who were asked what they feel when they argue with their spouse 83% of the men said disrespected, and 72% of the women said unloved. Marriage is like a big rock. It’s as strong as a boulder at the beginning. But with every argument, every cross word, every act of anger and resentment, it’s chipped away. 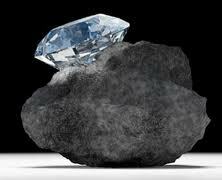 Instead of treating your marriage like creek rock, treat it like a diamond. Cherish it and protect it to the point that you will submit to losing the argument over having it chip away. In the end, if you’re left with the diamond, you’ve won something greater than the argument.